The Twin Valley Weed Management Area (TVWMA) is a group of public and private agencies and individuals who are concerned with stopping the spread of noxious and invasive plants located in the Twin Valley Weed Management Area. The TVWMA was formed in 2004, in a 12 county area. We began working with landowners and managers, developing outreach and education programs. The group has focused on restoring riparian areas in the Republican and Little Blue River Basins. The first three years, the group’s primary objective was to open up the 80 mile Republican River channel from Harlan Dam to the state line south of Hardy, Nebraska. 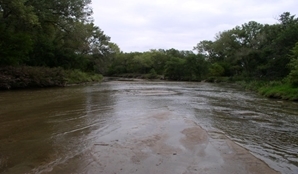 It was most critical to get as much water down the river (unobstructed) as possible to meet the high water demands of the Kansas/Nebraska Water Compact. 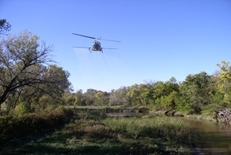 This initial effort also included a large scale aerial and terrestrial spraying effort on the river and shoreline of Harlan County Reservoir to combat dense stands of phragmites and salt cedar with excellent results. Excavators and other heavy equipment was then contracted to remove logjams and debris from the river channel. This was then followed up with deep disking and controlled burns of the islands to scour out the channel. 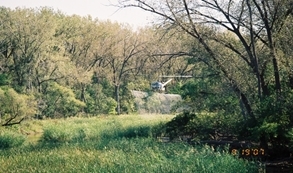 Funding for the first phase of work was provided by the Nebraska Department of Agriculture and LB-701, which was introduced by State Senator Tom Carlson. Phase two involved cleaning out the Republican River channel from Harlan Lake westward to Cambridge, Nebraska. Also included was removal of pinch points which impeded water flow with heavy equipment. 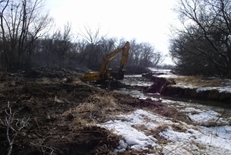 Phase three involved vegetation management and river clearing on the Little Blue River from Campbell to Gilead, Nebraska. Also, five tributaries to the Republican River, totaling 114 miles, were also cleaned out to allow for unobstructed water flows and to open up springs that had been silted over. Much of the work being performed now is maintenance and follow-up. Future funding is very critical, as our labor and efforts could all be in vain if we turn our backs on the river cleanout and riparian area vegetation management. Project Area consists of 146 miles of the Republican River and 125 miles of the Little Blue River. 280 different landowners own property adjacent to the Republican River and 265 landowners adjoining the perimeter of the Little Blue River. 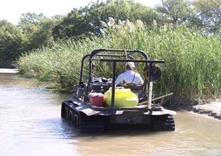 The invasive weed called phragmites was put on the Nebraska Noxious Weed list six years ago. Since that time it has become very prevalent in South Central Nebraska. We need your help in reporting to us any sightings that you may have had so that we may chemically treat it.